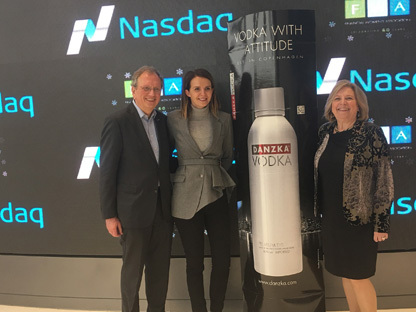 The launch of DANZKA Vodka in the United States received a prominent boost this month, when the brand sponsored the annual charity holiday benefit for the prestigious Financial Women’s Association (FWA) in New York City on Dec. 5. There DANZKA held an exclusive tasting event with two DANZKA cocktails specially created for the occasion. The event took place at the NASDAQ MarketSite in Times Square, one of the most important financial venues in the world, and home to the CNBC broadcast studios, the major US financial television network. The event was sponsored by DANZKA brand-owner Waldemar Behn, and CIL US Wines & Spirits (a division of Camus International), the company distributing DANZKA in North America. 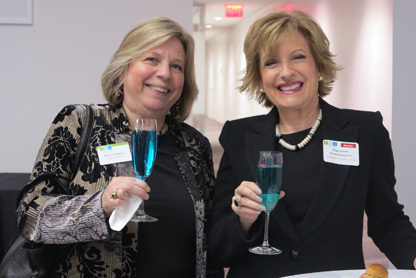 Members and guests of the FWA enjoyed an exclusive cocktail reception where they got to enjoy the DANZKA Blue Chip* and the DANZKA Ticker Tape**. DANZKA enjoyed prominent signage and promotional support at the event. The NASDAQ launch should also benefit DANZKA’s travel retail business, notes Rüdiger Behn. The Financial Women’s Association is a non-profit professional organization that acts as a voice for women in the financial community across all industries. It was established by a group of Wall Street women to support the role and development of women in the financial services industry 60 years ago, FWA now numbers more than 1000 members worldwide. Some 85% of the memberships are holding senior positions of power and influence within their companies, which range in size from very large to small firms. “It was a great event and we were thrilled to have DANZKA drinks specifically crafted and named to go with the theme and locale. You might say that DANZKA Blue Chip and DANZKA Ticker Tape were born on the floor of the NASDAQ. Fabulous fun!! !” said FWA President, Katrin Dambrot. The two DANZKA Vodka Cocktails created especially for the FWA Holiday Benefit at the NASDAQ Marketplace by the mixologists at CIL US Wines & Spirits, include DANZKA Blue Chip*, a slightly sweet cocktail made with DANZKA Vodka, Blue Curacao, Orange Biters and Sparkling wine and DANZA Ticker Tape**, a refreshing, holiday forward cocktail combining DANZKA Vodka, St. Germain, Sparkling Wine and Grapefruit Bitters.